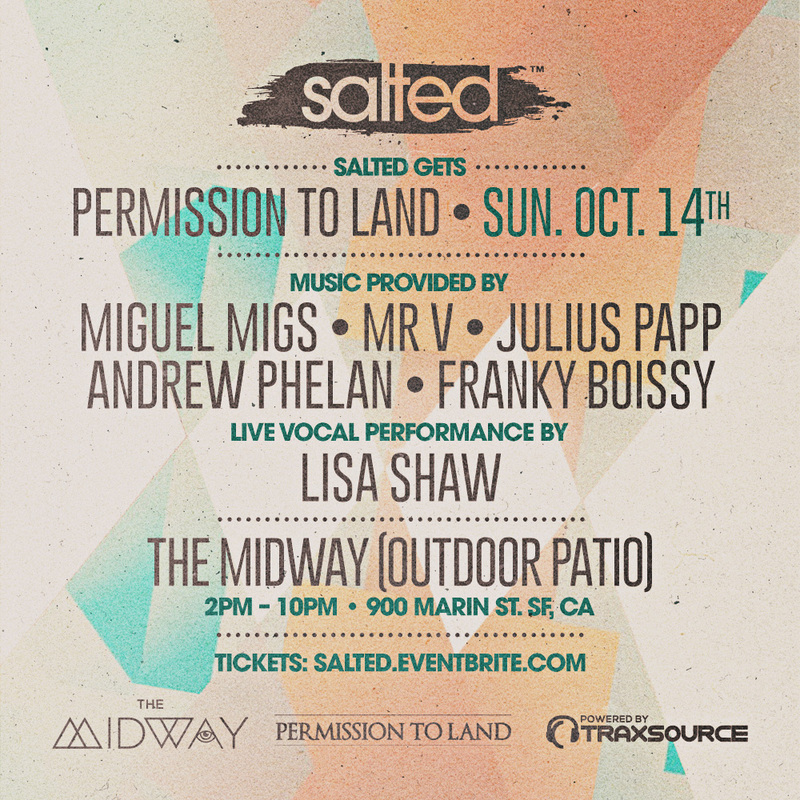 SALTED returns Saturday, April 6th, to The Midway (Gods & Monsters Room), welcoming our very special guest King Britt. 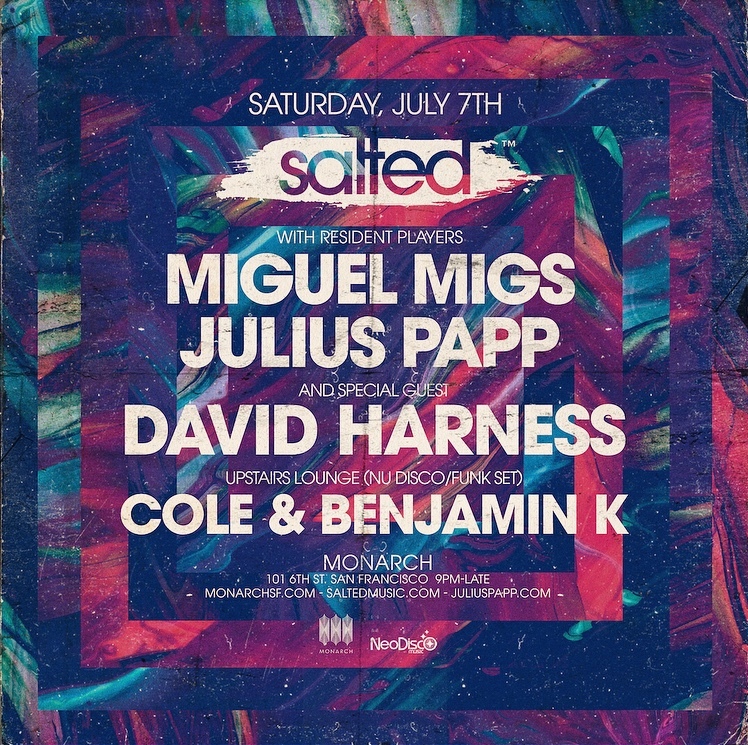 The legendary Philadelphia native needs no introduction, making his first appearance at Salted along with your resident players Miguel Migs and Julius Papp. 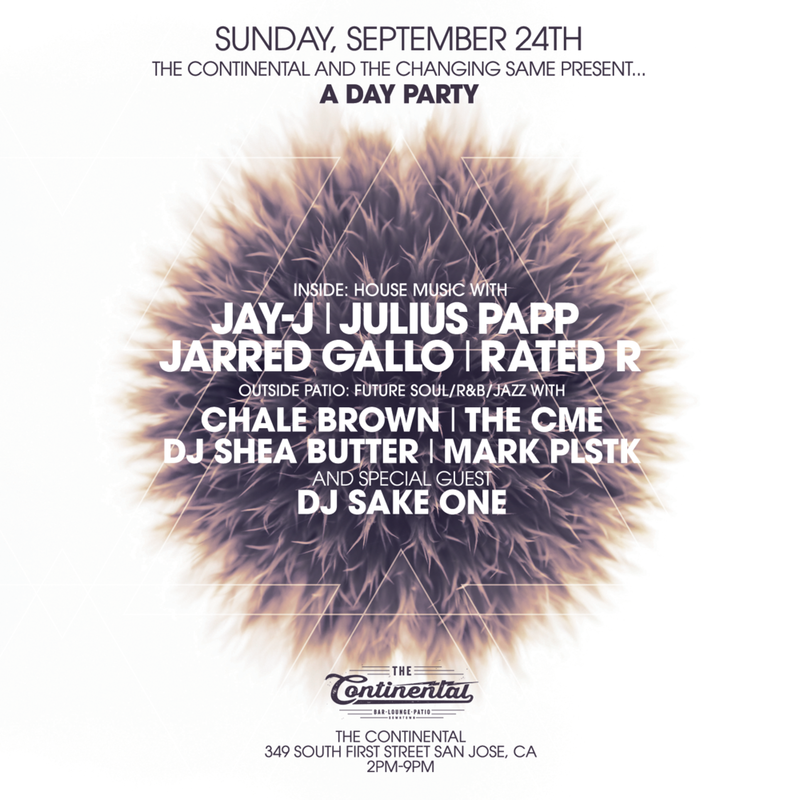 Join us Sunday afternoon for this one off special event featuring TORTURED SOUL live! Will also be sharing the decks with The Selecter DJ Kirk and DJ Rated R…plus outside on the patio will be The Changing Same djs Chale Brown and The C.M.E. 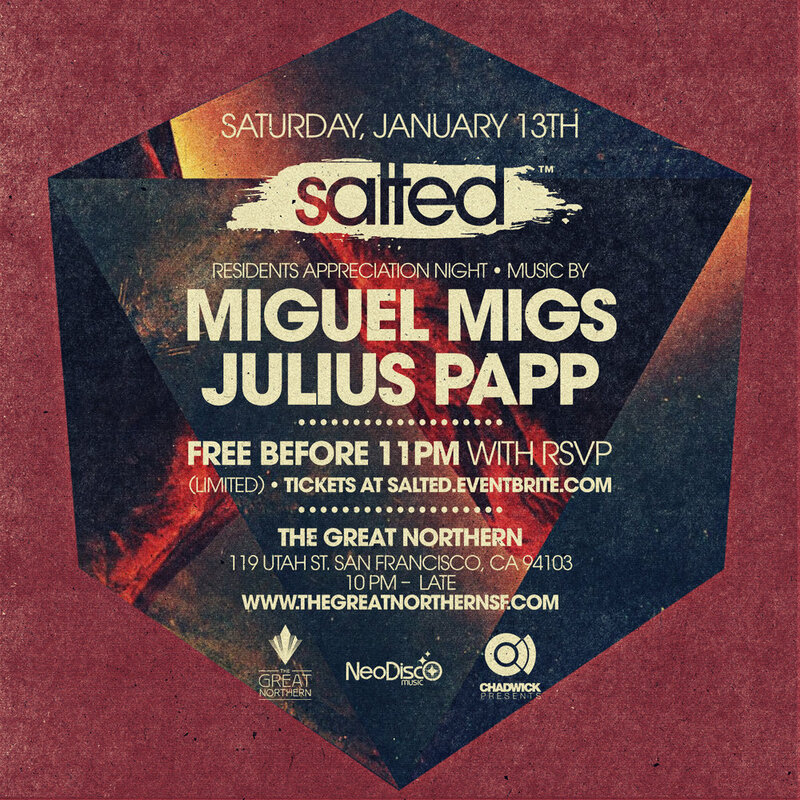 Join us for SALTED on Saturday, January 13th (at The Great Northern), as we welcome in a fresh new year with open arms…We are kicking things off with a residents appreciation night, offering FREE entry before 11PM with RSVP…Miguel Migs and Julius Papp will curate the music all night long so come get down with us as we begin 2018 and celebrate 13 years of Salted love! 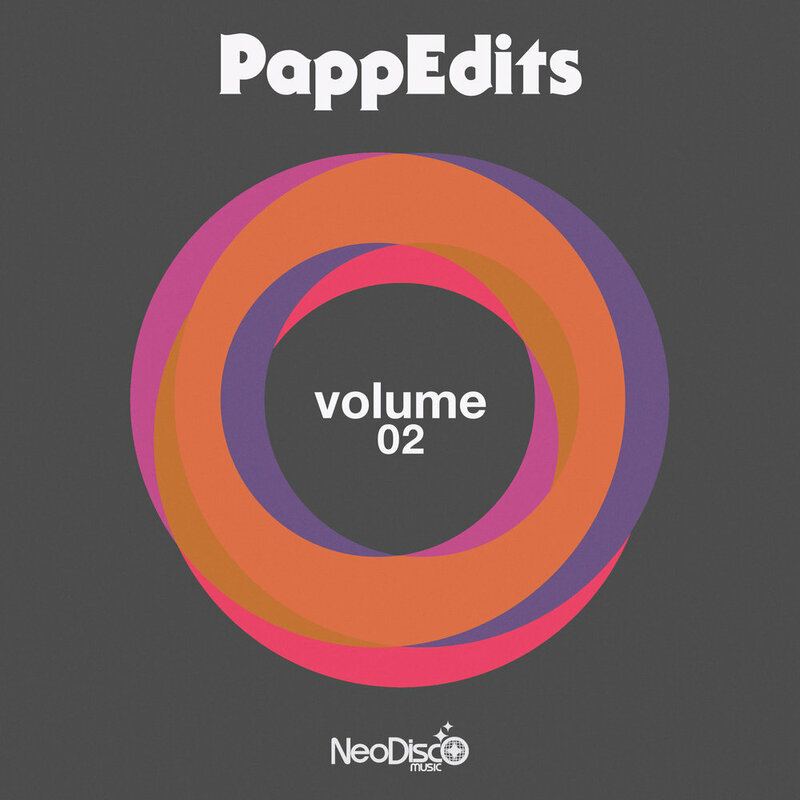 "Our own San Francisco based legendary heavyweight Julius Papp delivers his long awaited Salted debut release featuring some classic flavors on the colorful Phunk Odyssey EP - loaded with soulful Nu-Disco laced sounds and drenched in plenty of melodic synth heavy delight smothered in percussive bliss. 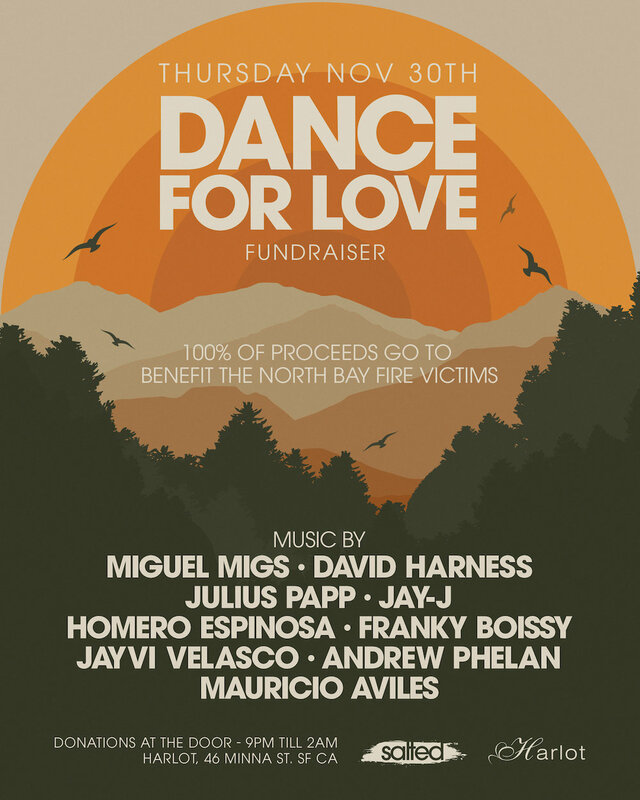 Mr. Papp showcases some of his vast musical influences and creative production talents for your dance floor pleasures..."
Please join us on Thursday Nov. 30th at Harlot as we come together to help out our North Bay neighbors in need. The struggle to rebuild from the recent devastating fires will continue for a very long time to come, but we can help make a difference through every dollar donated. We will be taking donations at the door, so please do what you can and come help us raise funds for those in need, and Dance for Love! We welcome back local favorite David Harness, along with resident players Miguel Migs and Julius Papp, while upstairs in the lounge The Selecter DJ Kirk (Sweaterfunk) will be dropping some soul/funk/disco jams.